I can’t imagine that too many Iowa gardeners will be planting potatoes in accordance with the Good Friday tradition this year. The ground currently is too cold and soggy to plant potatoes or much of anything else and Good Friday falls on March 29 this year – the earliest it’s been in five years. One exception could be container planting, though I’d still be hesitant to plant with daytime temperatures barely above freezing. For the past two years, I’ve planted potatoes in extra-large containers and find the harvesting is exceptionally easy. You really don’t even need any tools to dig up a handful of “new” potatoes. Use coffee sacks, half-whiskey barrels or other large containers to plant the potatoes. I use a mixture of peat moss and potting mix, leaving room at the top to continue adding soil or mulch – such as straw- as the plants grow. 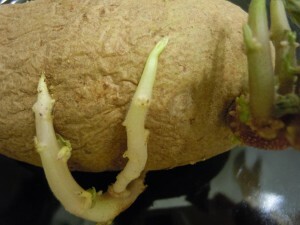 You can buy seed potatoes at garden centers and plant whole, if they are small, or cut into several sections with one to two eyes each. I first planted potatoes in my garden after my grandmother gave me some she had started. I didn’t realize they were potatoes she had purchased to eat that had sprouted until the following year when I asked about the method she used, but they grew well that first year and we harvested quite a bit. I know that’s not the recommended method, but it did work and we didn’t suffer any ill-effects, as far as I know, from eating those potatoes. I finally gave up on planting potatoes at the plot I leased at the city gardens in Squaw Creek Park when Colorado potato beetles continually decimated the crops. So far, the dreaded beetles haven’t bothered my container potatoes, so I hope that holds true again this year. For the record, Iowa State University Extension advises gardeners to plant potatoes in late March or early April in southern Iowa; early to mid-April in central Iowa; and mid to late April in northern portions of the state. New potatoes are then generally ready to harvest by July.